We know it can be hard to say goodbye to your old waste removal company, that's why we make Budget Dumpster so enticing that you won't be able to resist making the switch. 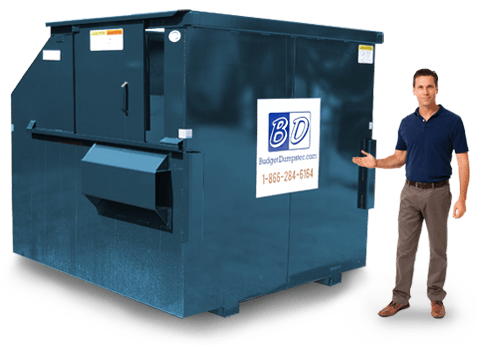 Budget Dumpster offers a wide variety of commercial dumpsters that can accommodate any waste load, regardless of whether you run a small corner restaurant or a warehouse. And our prices are so low that we can accommodate just about any size company's budget. 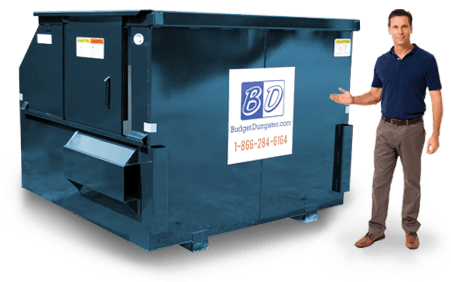 So if you are looking for a low-cost resolution for your waste removal situation, just give Budget Dumpster a ring. We know how hard it is to pick a service out of a wide field of possibilities. But we can assure you that Budget Dumpster knows how to get it done for less! Whenever we meet a new customer, we see it as starting a new relationship; one that could last a lifetime if we put the effort in. That's why we take the time to get to know each of our customers. So when that phone rings, we can catch up on what's happening in their neck of the woods. And that personal touch of ours applies to everything about us, from our pricing down to our contractual terms; everything we do is set up to benefit our customers, our friends. Our 2 yard dumpsters are perfect for small businesses and for those who do not have a lot of space on their property. A 2 yarder only takes up the amount of space a car would, so it is great for small parking lots. These dumpsters are super easy to fill because they are only 3ft high and small enough to toss all of your items right into the container. These waste bins will give you the most bang for your buck when it comes to small amounts of waste removal. If you have a small restaurant or office building, the 2 yard "baby bin" may be the perfect fit. The 4 yard dumpster is the perfect fit for a small to medium sized business. If you have less than 1000 pounds of trash, this may be the right size for you. This is a convenient size waste bin that doesn't sacrifice capacity. It can be placed on most properties and used for a wide variety of businesses. It can handle small amounts of bulky material as well a good amount of regular trash. We have seen many small grocers and places of worship utilize our 4 yard dumpster with no issues. 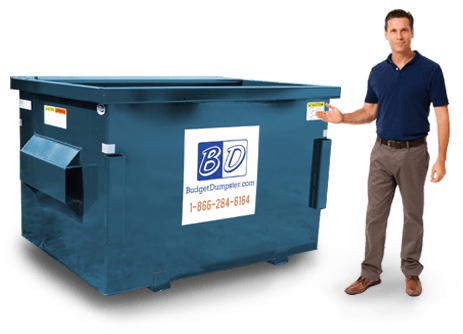 If you think this size dumpster is best for your business, give us a call today. The 6 yard dumpster/> is the dumpster you can find in almost every shopping mall or outlet in the area. This all-around bin can be the best waste container for large apartment complexes, strip malls or even big grocery stores. It is also very easy to toss your trash into the container with the sliding door. Our 6 yarder is great for the business with a good amount of space as well as trash. These containers can handle a wide variety of trash including bulky material and food waste. This dumpster can hold up to 1400 pounds of debris, so you won't have to worry about going overweight. Our large and in charge 8 yard dumpster is designed for large warehouses, office buildings and distribution centers. This dumpster is not one you will find in the parking lot of a Hardy's; no, it is reserved for large amounts of waste materials. Our 8 yarder can handle a scale breaking 1600 pounds of debris. This option can be great for large amounts of heavy and bulky materials. 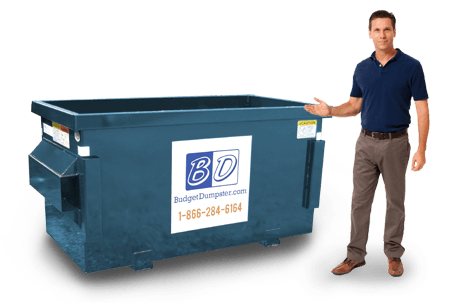 If you are in need of a heavy duty dumpster for a great amount of waste, give Budget Dumpster a call.